On behalf of Admin of JML Law, A Professional Law Corporation posted in Pedestrian Accident on Thursday, Jan 10 2019. Anaheim is a walking place. Between Disneyland Park, Anaheim Garden Walk, Adventure City, and not to forget the robust nightlife, people are walking all over the place. Walking is a healthy exercise that not only improves your health but also the health of the planet. By reducing carbon monoxides, walking can help with smog and other air pollutants. However, did you ever think about the price you may have to pay for walking like your life? This may seem exaggerated, but the truth is pedestrians are hit by cars more than we think. California is the 15th highest in the nation for pedestrian accidents and this isn’t because California is one of the largest populated states. In the past 25 years, pedestrian accidents have increased and may be heading toward an all-time high. This news isn’t meant to scare you into not walking. Instead, it is meant to enlighten you to the risk you may deal with while walking and give you good information to help you if you have been struck by a car. When crossing the street by using a crosswalk it is a good habit to make eye contact with the drivers that are waiting at the light. When a walker makes eye contact with a driver it is a good indicator that the driver sees you and is willing to yield to you. 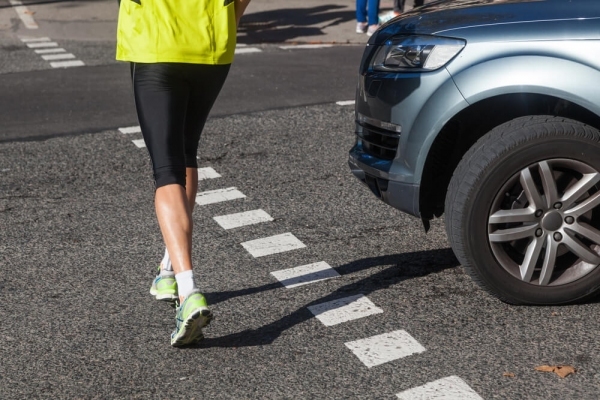 As a pedestrian, you should also make sure to wear bright clothing, particularly while walking at night, and pay extra attention to the cars that are driving your way which means try not to be distracted by phones or conversation while walking across streets. It is important to pay attention because the likelihood for fatalities to pedestrians is when a car is going faster than 20 mph. Also, pedestrians over the age of 65 or small children are some of the most vulnerable populations for fatal injuries. Such injuries include fatal back, neck, and head injuries, knee injuries, and shoulder injuries. The faster the car the more severe the injury. It is not just the pedestrian’s responsibility to watch out for cars. Drivers are also encouraged to look out for walkers. This was not the case for a 49-year-old gentleman who was crossing the street and was struck by a vehicle. The pedestrian was walking outside the crosswalk. To be a safe driver you must remain alert at all times. If you have suffered from an injury while walking then our Anaheim pedestrian accident attorney at JML Law, a Professional Law is here to help you get your life back together. Any time a person is hit by a moving car, the chances of an injury-free accident is slim to none. Not only can our attorneys help you get a suit started, but we can also help you locate medical attention that will delay billing to better accommodate your situation. Call 818-610-8800 or click here to start a conversation with our knowledgeable Pedestrian Attorneys today.